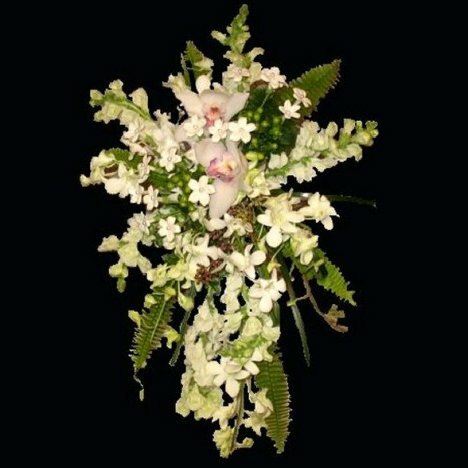 This dendrobium orchid bridal bouquet is really coming together. I love mixing in different varieties of greens to accent the overall design. 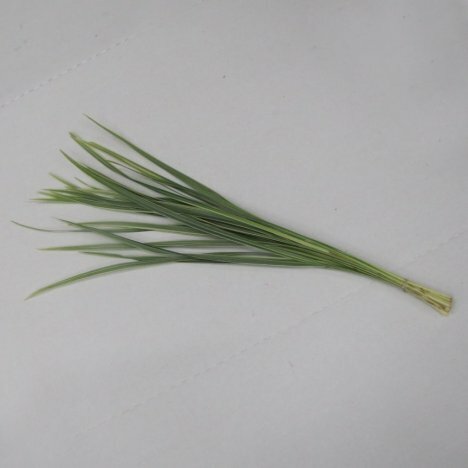 Next I'm using Lily grass - which comes in both solid green and variegated. I bent the individual blades of grass over to create a loop and insert the cut ends into the foam to keep the loop shape. Cut sharp angles on a couple of straight blades and insert them into the lower right hand side, under the seeded eucalyptus. The lily grass is stiff enough to insert them into the foam like this. Bear grass is too soft. 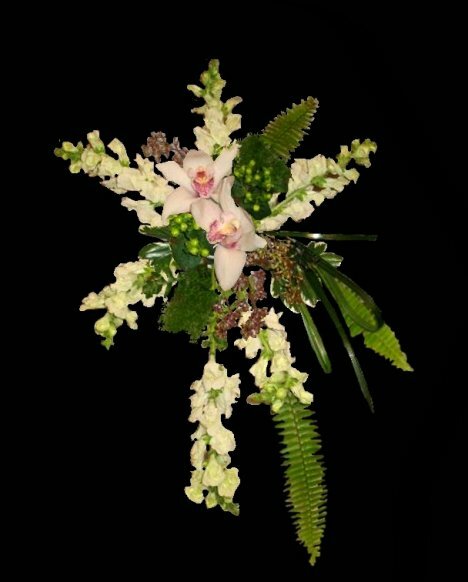 Now I'm adding in a little flat fern to this dendrobium orchid bridal bouquet. 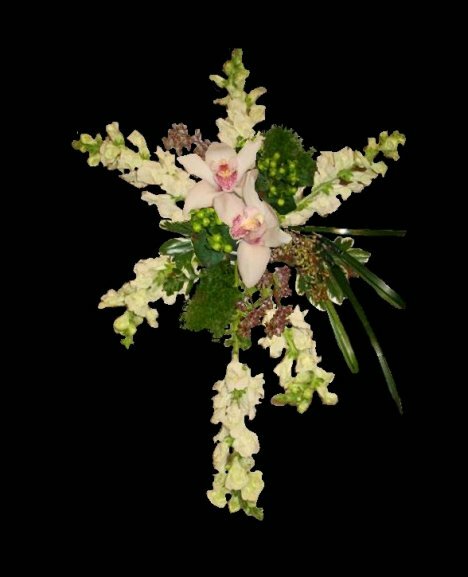 The distinctive shape adds a lot of eye appeal and fills in the sides of the bouquet. Cut the stems smaller and then strip off the lower leaves for a bare stem to insert into the foam. 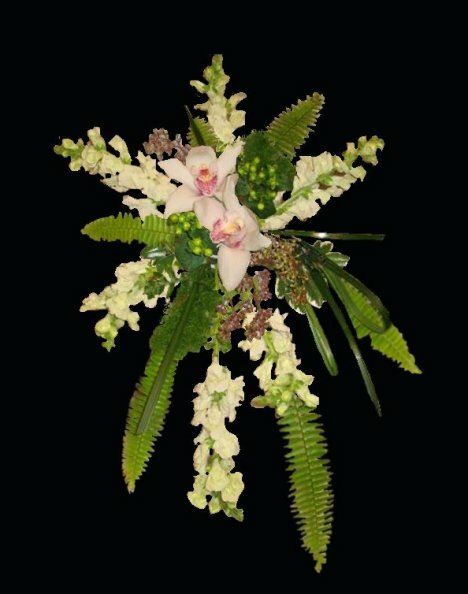 I use shorter stems of the flat fern at the top, as I don't want them to come up too high and cover the bride's bodice. 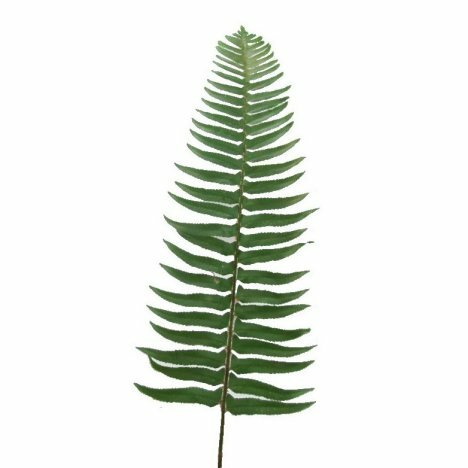 The lower stems of the fern can be longer, inserting under the grass loops and trailing down the long length of the cascade. 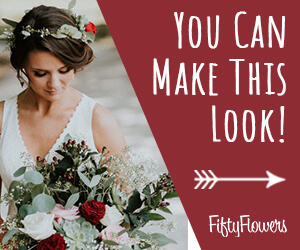 Fill out on the left side of the bouquet in a similar manner that you did on the right side. 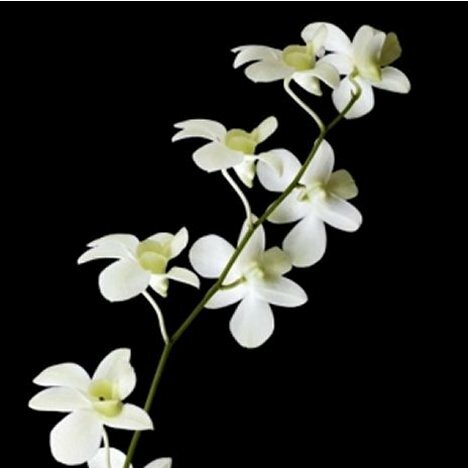 Don't overdo, as you still have the dendrobium orchids to insert. With my last short fern behind the seeded eucalyptus at the time, I'm ready to move on to the dendrobium orchids. These fragile beauties are packaged in a clear wrap. Be sure to take care when opening the sleeve, as their blooms may be entangled with the others. Separate them gently and lay out on your work table. 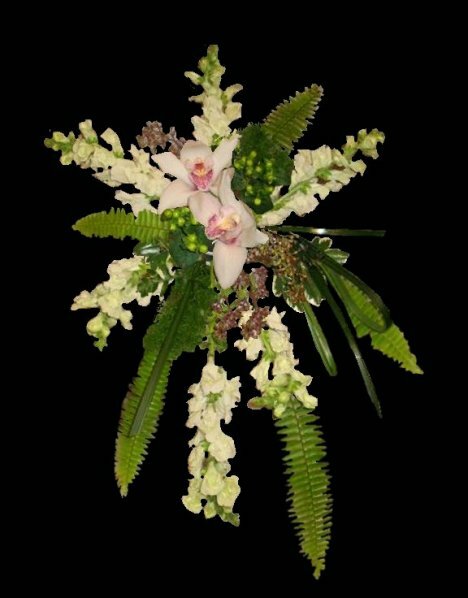 Be sure to set aside a bloom or two to use on your groom's lapel It is always nice to make his boutonniere a little more special, matching the bridal bouquet and setting him apart from the other groomsmen. You will have to wire the lobe in the back to use as a boutonniere. Now I simply cut the lengths of orchids apart, inserting them at random in the bouquet. They fill in the final design nicely, with the long trails giving off a lovely scent. 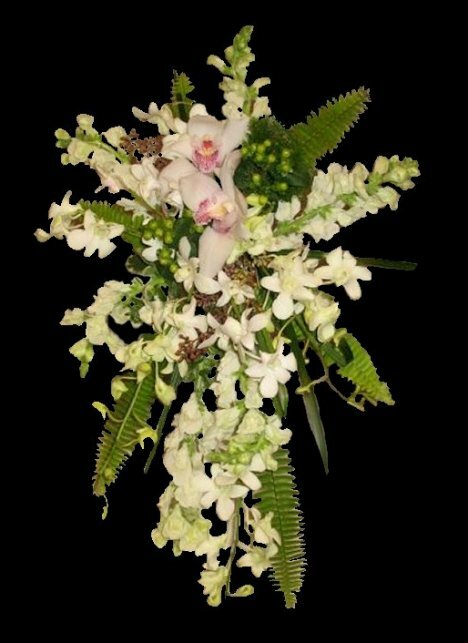 To make this bouquet even more gorgeous, consider adding in a few stems of stephanotis. 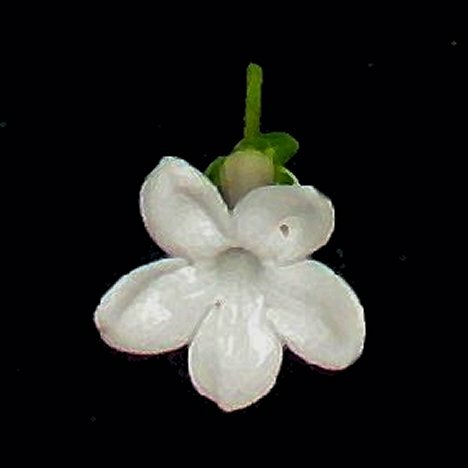 Also commonly known as jasmine, these fragrant flowers are truly beautiful. 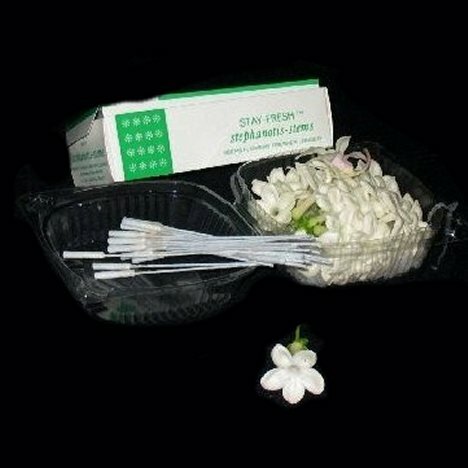 You will need Stay-Fresh stephanotis stems, which have to be soaked before inserting into the throat of the stephanotis. 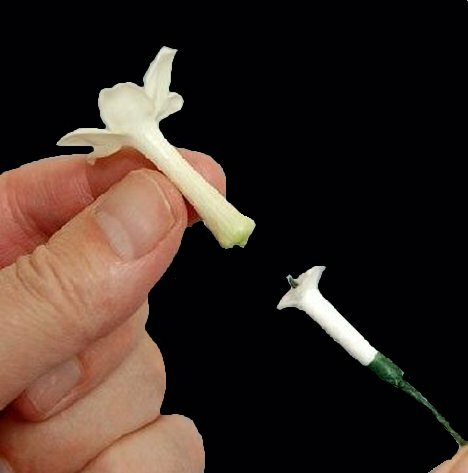 Simply pop off the lower stem, leaving the perfect white bloom. 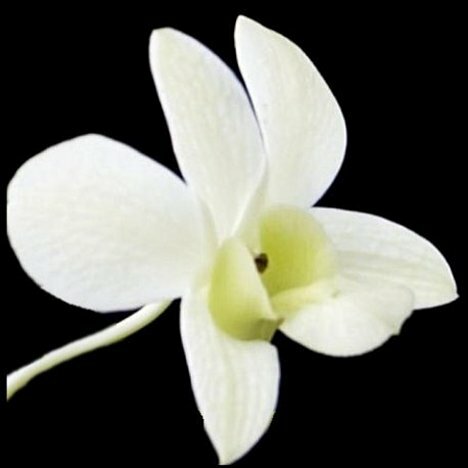 Gently push the wet flower pick up into the bottom of the stephanotis. You can insert pearls into the throat of each bloom if you wish. 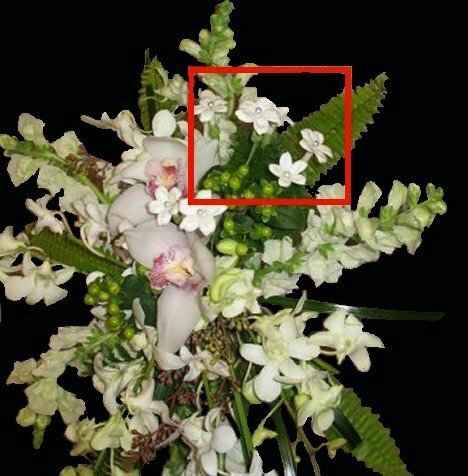 Insert these in clusters around your dendrobium orchid bridal bouquet. I do advise that you keep your bouquet misted with Finishing Touch and allowing it to dry before it goes into your refrigerator. 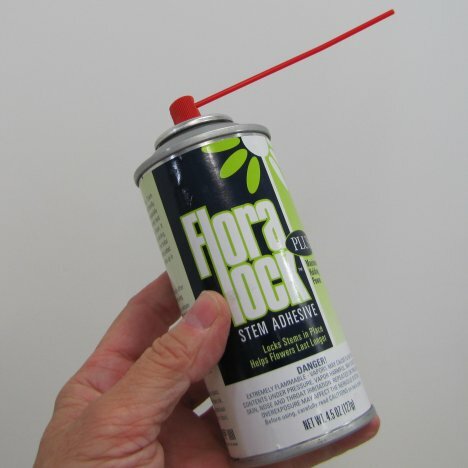 To be sure that all stems stay in place in this long cascade, I use Floralock Stem Adhesive. Be sure to follow the directions on the can, shaking the contents well before spraying to thoroughly aerate the glue. 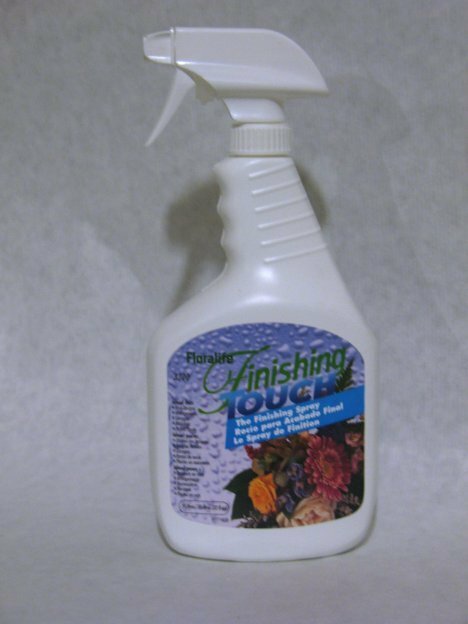 I always use a flower sealant on every design I make. This helps keep the petals sealed and the moisture locked into the flowers. Traditional home air conditioners and refrigerators are designed to take excess moisture out of the air. 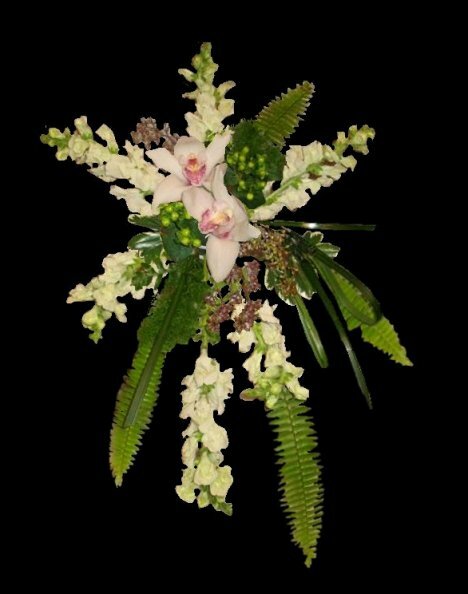 Professional floral coolers deliberately put heavy moisture INTO the air, keeping the flowers moist and fresh. This product will help you do the same.